On januari 13, 2005,	Posted by Victor ,	In Oude doos,Reisverslag,	With Reacties uitgeschakeld voor Pushing the envelope…? Sometimes events on the water evolve in ways that leave a lasting memory. Most such moments might be passed off as part of a learning curve…. personally I am not ashamed to admit that on one occasion this past summer ‘lucky escape’ might be more accurate. It all started so gracefully. In warm breakfast time sunshine we wandered aimlessly amid the silent memories of Camus Fearna…the setting of Ring of Bright Water. Our Drascombes drawn up at low water along the beach below the site of the ancient croft. Faint breaths of wind rustled through the forest… little ripples on the water : spirits of the otters lingering from more famous days.? It was a perfect mid summer morning. Later we played these same zephirs, drifting gently out across the entrance of Loch Hourn, heading south towards the point of Sleat. Although the forecast had hinted that by late afternoon a strengthening south easterly could develop, increasing to gale force overnight, that was for later. Now, mid morning, as the light wind filled in from the east, we romped away south on a slack tide, full sail over a flat ocean. By midday Armadale was abeam and the group were spread out widely. But hugging the Skye shore, another hour or so would see us round Sleat point to head north once more for the safe haven of Soay. By then any strengthening wind on our tails would be a help, we could run down swiftly before it to reach our destination in a couple of hours more. But it was not to be. Banks of light rain blotted out the other boats as, subtly, the wind shifted more to the south east. Whisper’s wake was steady and true, but as the sheets were hauled ever tighter Armadale still remained just abeam. Even the trusty GPS told no lies, overground speed fell away. 3 knots became 2, then 0.5. Finally, still racing through the water, the VMG reached nil. The tide had turned…some strong eddy held us. It was time to tack. The wind built steadily, and the showers became heavier as we headed back towards the mainland, towards the entrance to Loch Nevis and the nearby safe haven of Mallaig. Spread out to windward the other boats peeled off as well, one by one, and also headed back across. Mallaig was the sensible option, and attainable too… for the latest forecast had said the wind was to veer southerly later. Each strengthening gust served to remind me that putting in an early reef would be wise: three turns off the foresail, and one reef in the mainsail. Speed dropped, but we were tracking well. Sudden squally showers, like curtains, swept down on us, isolating us on the ocean , but the course held good. It would not be long before we would be in shelter…. It was then that things started to go wrong. The parrel beads holding the gunter spar came loose, and as the speed dropped away it was clear that the mainsail would have to be lowered to retie them. By now the wind was already steady force four with gusts over well over five. In view of the predicted wind shift to the south, perhaps by just furling the main completely we would be fine. This was soon done, and the course resumed. 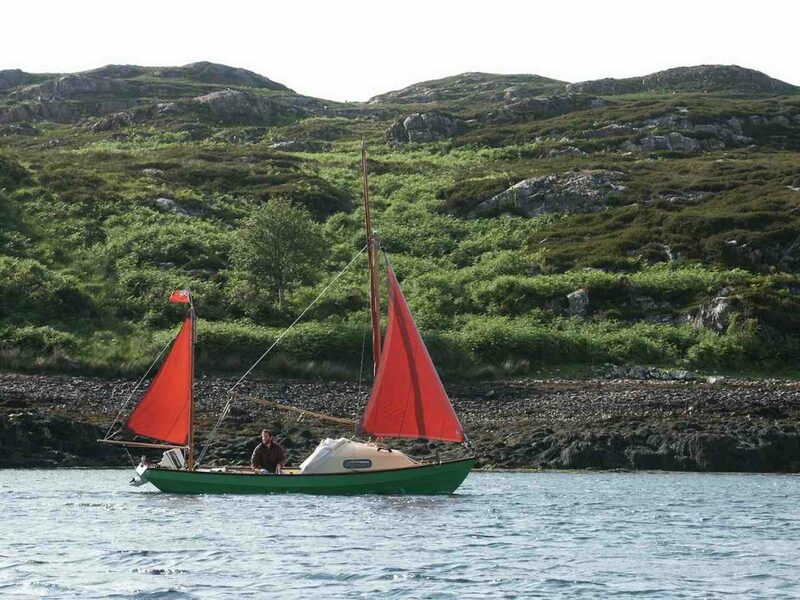 But now, under mizzen and jib alone, we lacked real power necessary to hold our heading up wind towards Mallaig. Bit by bit the tide was sweeping us back north again. There are so few ” break out ” options on that coast. In view of the gale forecast for that night by then only two choices remained. 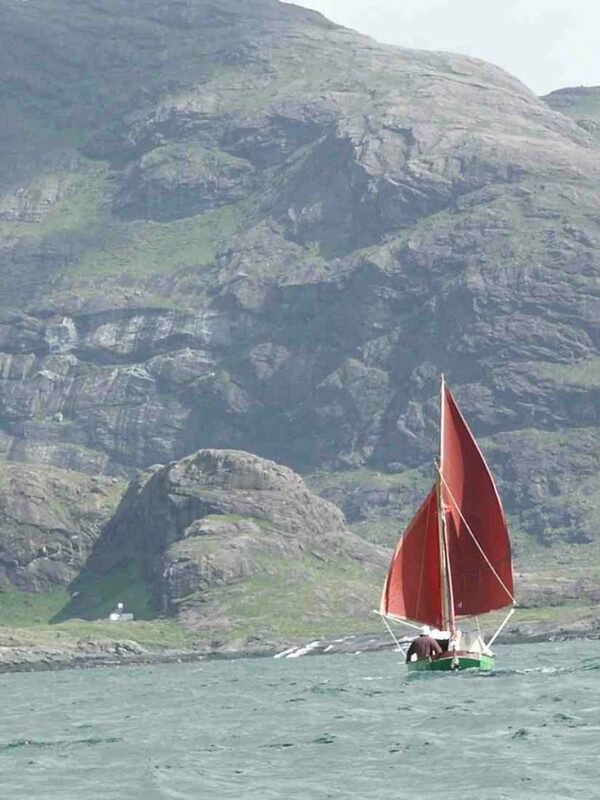 Fight our way upwind to Mallaig, or scurry blind into Loch Nevis to identify the recognised anchorage behind an island there. With the other Drascombe friends already well upwind and nearing the port, the decision did not take long. In spite of the strengthening wind we would hammer on upwind. But to do this the power of the reefed mainsail would be necessary again. So we hove-to once more and rehoisted the reefed sail. Then we tacked to the south. This was exhilerating stuff. As we crested each swell the full force 5 of the gusts would catch us, but we powered ahead…who says a Drascombe cannot go to windward in strong winds ? Once more we tacked, and then again… there was a sudden jerk and everything went pear shaped. Un-noticed, while slackening the jib sheet it had tangled with another line. During that first microsecond of distraction a breaking wave half filled the cockpit, the next second Whisper lay over to port on her beam ends. Looking vertically down across the cockpit was a new experience. The helm was useless. I let it go. Climbing down to lee to free the tangled sheet might yet complete the capsise… but ….was doing nothing except to cling on tightly really the best option…? I watched as the level of the sea washed closer and closer to the washboards of the main hatchway… I wondered what would happen next. Would the hatch cover fall off ? Would the cabin flood ? The mainsail , now lying flat on the sea, was filling with water. This was dangerous for it could hold the boat over. Reaching along I managed to cast off the main halliard, but my movement forward was all that Whisper needed , she slowly twisted around and bobbed upright again. The next minutes were a mayhem of flogging sails, snaking lines and swilling water. The cockpit was threequarters full, ropes like entrails trailed overboard, but the mainhatch was still closed and even the boathook was still wedged securely in its place on deck…nothing had been lost. Gradually I sorted things out. The reefed mainsail was rehoisted, the jib furled down till it was only about five feet high, and off we went again. Leaping across the swells. With them helm lashed I soon rediscovered the fact that Whisper could be balanced so she would round up herself in the gusts which were now well over force 6. Whole lumps of water were arriving blown clear from the tops of the waves to windward, but Whisper could cope. So I pumped hard to clear the quarter ton of water from the cockpit. Much later we crept, bouncing and crashing through the tide race into the lee of the mainland, and tacked to the south once more. Fierce sudden gusts came – ever stronger – hammering down from the hillsides above. But now, near the shore, the swell was less and there was some chance that the motor could get a grip. With the Johnson shoving us steadily against the worsening weather the mainsail came down, the jib was furled, and the last of the ocean was removed from the cockpit sole. Tourists looking down from the Mallaig pierhead that afternoon might just have noticed a salt streaked little boat seeking shelter from the growing storm… the experience aboard during the last few hours …well… who would have believed that ? PS. Whisper is adapted from standard in several ways. Firstly there is a heavy car battery secured in the bilges, next to the C/B case, under the bridgedeck. The deck hatches have rubber seals under them and are hinged and fastened so they cannot fall open. Secondly – that day – there were about 30 liters of drinking water in jerrycans wedged right up forward in the cabin on the floor. Thirdly all the stores and equipment are always kept low in the hull, secure in plastic boxes so they cannot shift about. Fourthly very little heavy kit was in the rear lockers at all…a few ropes, some fenders, a small 5 litre can of spare fuel (almost empty), the cockpit tent, and a cockpit well cover. That’s all. I suspect that had the weight in the hull been stowed higher -or further aft – the outcome would have been much wetter ! This is because it appears to me that it was mainly my movement forward to free the main halliard that allowed Whisper to come upright. Oh ! and it’s certainly possible that the outcome might have been less agreeable had the extra weight of a crewman been aboard… but who can tell . ?